This month’s food and memory blog is written by Ana Sortun, the talented chef who brought Middle Eastern flavors to Boston. She remembers a lunch on her first trip to Turkey, which changed her approach to cooking. Sortun’s Gazientep Chicken is both tender and crunchy, creamy and light. Ana Sortun graduated from La Varenne Ecole de Cuisine de Paris and opened her first restaurant, Oleana, in Cambridge, Massachusetts in 2001, immediately drawing rave reviews from publications including the New York Times. She was named Best Chef in the Northeast by the James Beard Foundation in 2005, after which she opened Sofra Bakery and Café in Cambridge. Sortun co-owns Sarma in Somerville and is the author of two cookbooks—Spice: Flavors of the Eastern Mediterranean and Soframiz: Vibrant Middle Eastern Recipes from Sofra Bakery (with Maura Kilpatrick). Ana is known for bringing Middle Eastern flavors to Massachusetts through her passion for spices, Turkish cooking, and using fresh, organic vegetables from her husband Chris Kurth’s Siena Farms. She was named a semi-finalist for the James Beard Outstanding Chef award in 2015, 2016, and 2017 and remains one of America’s most influential chefs. In 1997, I was working at Harvard Square’s Casablanca restaurant, cooking Mediterranean food mostly inspired by my travels to Italy, Spain and the south of France. 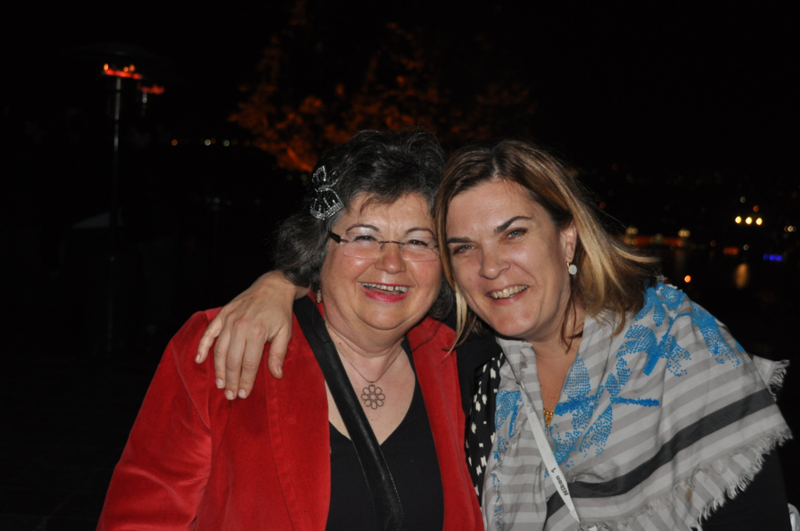 One evening I met Ayfer Unsal who was visiting Cambridge and dining with my boss. She invited me to visit Turkey and to study the cuisine from her hometown, Gazientep. When I thought about going to Turkey, I imagined genies and flying carpets. I had no idea. It’s the memory of an incredible “potluck style” lunch that she and 30 of her friends prepared for me, and that changed my work forever. Since that moment, I took an interest and began to study Turkish ingredients, spices, recipes and techniques. A few years later, I opened Oleana in 2001 to bring these flavors into the Boston mainstream and to expand the city’s perception of Mediterranean cuisine. Recently, I was flipping through my notes from that first trip to Gaziantep in 1998. There were very rough notes on a dish with tahini and dried fruits and a marinade with pepper paste and onions. I adapted these notes in the following recipe, to re-create a dish that works for both special occasions and everyday meals. Mix onion with 1 tablespoon olive oil, 2 teaspoons baharat, tomato paste and water. Pour over chicken breasts and stir to coat. Let stand for 20 minutes. Bake chicken on a baking sheet for 8-12 minutes depending on the size of the chicken. Meanwhile, finely chop the pistachio and pinenuts. Fry them gently in 1 tablespoon of olive oil until light brown and just barely toasted (about 4 minutes). Stir in garlic, and continue to cook for another minute. Remove from the heat and stir in currants or cherries. Blend yogurt, tahini and remaining tablespoon of olive oil to form a smooth sauce. Season with salt to taste. 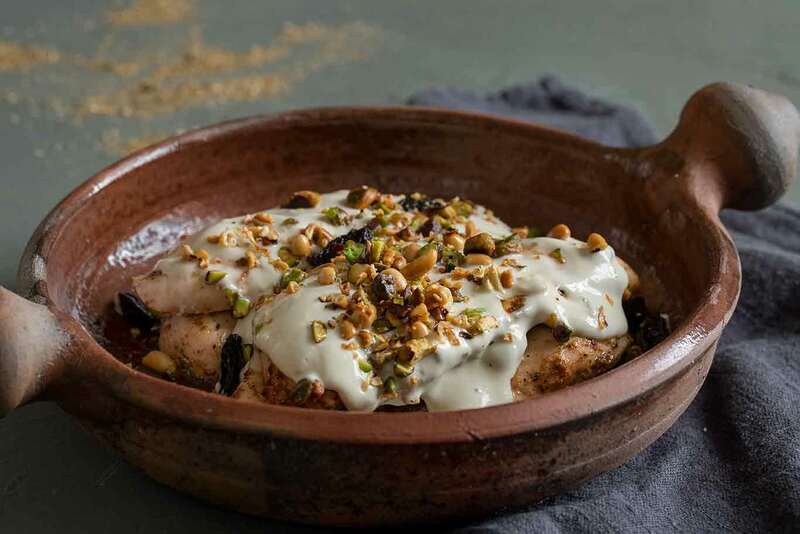 Slice chicken and top with the tahini sauce and nut mixture.